Code::Blocks is an open-source, cross-platform, full-featured C, C++, and Fortran IDE designed to be very extensible and fully configurable. While Ubuntu provides the old Code::Blocks 13.12 release in its universe repository, this tutorial shows you how to install the latest stable Code::Blocks 16.01 using PPA. 1. Add Code::Blocks Stable PPA, so you can receive future software updates along with system updates using Software Updater. Type in password (no visual feedback) when it asks and hit Enter to add PPA. 2. If you have Synaptic Package Manager, you can now launch it, search for and install the IDE after clicking Refresh. You may need to log out and log in back after installation to make it available in Unity Dash/App Launcher. And the PPA can be removed via Software & Updates utility -> Other Software tab. does it come with compiler ? Compiler for what ? On ubuntu you can install compiler directly by apt-get, on windows you have mingw port on sourceforge for example. 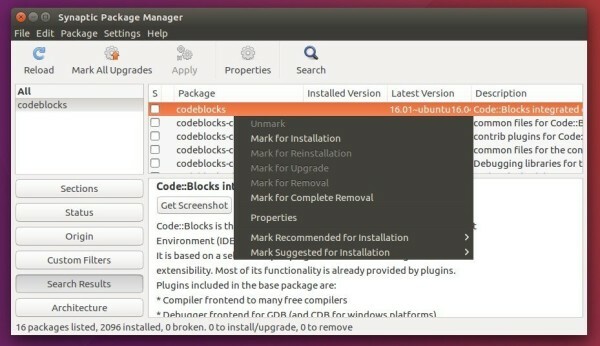 BTW maybe codeblocks have version with compiler, default no. Thanks! the only tutorial that worked really! Thanks a million it really works . Now if I can just get Unity to show all applications in the dash. thx a lot it works very well.